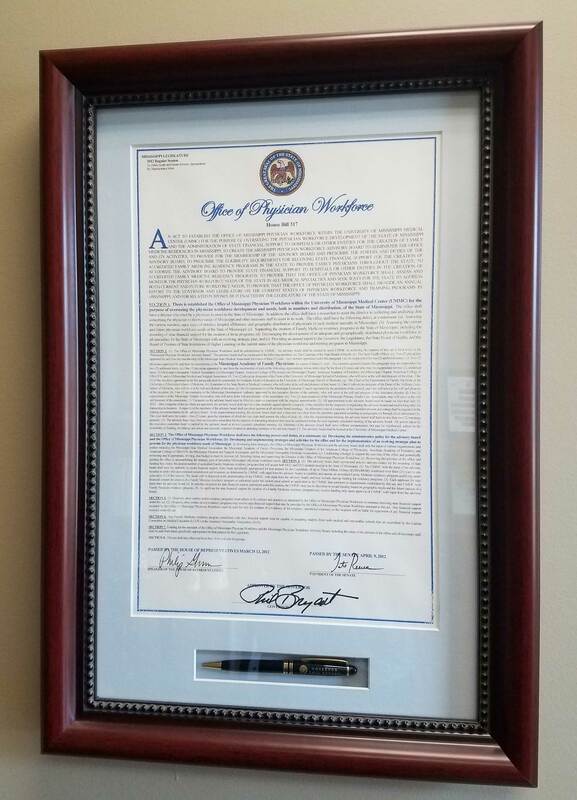 A signed copy of the bill creating the OMPW hangs in the MAFP office. The Office of Mississippi Physician Workforce (OMPW) was established by House Bill 317 that was signed into law by Gov. Phil Bryant on April 24, 2012. The bill, introduced by Rep. Sam Mims, created an office within the University of Mississippi Medical Center for the purpose of overseeing the physician workforce development and needs, both in numbers and distribution, for the state of Mississippi. 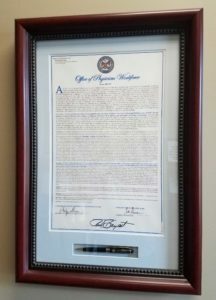 Initiated by the Mississippi Academy of Family Physicians, the introduction of such legislation was supported by the Mississippi State Medical Association and the University of Mississippi Medical Center. As one of the most medically-underserved states in the country, Mississippi has the lowest per-capita primary care physician supply in the nation. In 2012, the state had 8.3 doctors per 10,000 Mississippi residents, compared to the national average of 12.8 physicians per 10,000. Mississippi must add 1,330 primary care physicians to its workforce to raise this number to the national average. – Assessing the current and future physician workforce needs of Mississippi.